FREDERICK ROBERTS V.C. Photograph signed. British soldier and holder of the Victoria Cross. Frederick Sleigh Roberts, known affectionately as "Bobs" was arguably the most successful British military commander of the 19th century. 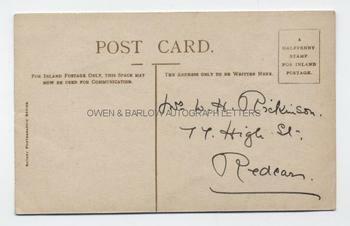 Post-card real photograph by Rotary, with the autograph signature of Frederick Roberts in top left corner of the image. 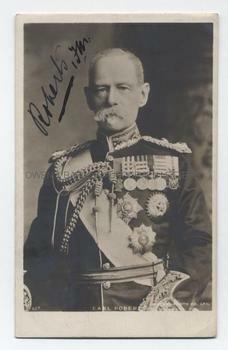 A nice portrait which shows the formidable soldier, half-length in full dress uniform, displaying his Victoria Cross and other decorations. Post-card measures approx. 5.5 x 3.5 inches. Addressed on the verso to Mrs W.H. Rickinson, 77 High Street, Redcar. Fine. Frederick Roberts was one of the greatest commanders in British military history. He had won his Victoria Cross as a lieutenant in the Indian Mutiny and served with distinction in Abyssinia, the Afghan War and the Boer War.